I‘m completely puzzled by the British TV show, My Big Fat Gypsy Wedding, now aired on TLC. 16 year old Irish Travellers (negatively labeled “gypsies”) marrying boys their age and preparing for a life of cooking and cleaning, beginning their domestication with the most outlandish, over the top wedding celebrations. It’s a fascinating culture of scantily clad young women with traditional Roman Catholic values and male dominance as breadwinners, as well as prejudice and ostracization by their neighborhoods (the “country folk”). Watch it sometime–I’m warning you, though, it’s a mind warp, but still interesting. We made this the other night, and it’s time to share…Giada’s Parmesan Crusted Chicken Tenders. Easy, tasty, versatile. We had this with a side of macaroni & veggies one night, and I’ve topped a bed of salad mix with a few tenders to make a filling/healthy lunch the last two days. You can make a sandwich with it, come up with homemade sauces for dipping, the possibilities are endless! Cut tenders to desired size and place in a large bowl. Pour buttermilk over the chicken and stir a bit. Let soak for 15–30 minutes. In a large pie pan, combine parmesan cheese and bread crumbs. 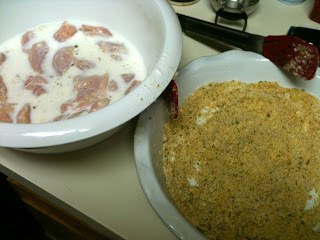 One by one, roll and press chicken into bread crumb mixture. Arrange breaded chicken onto a cookie sheet lined with foil (or parchment paper). Brush olive oil on the foil before adding chicken. After sheet is full of tenders, drizzle a little extra olive oil on to prevent sticking and keep chicken moist. Bake at 425 for 12-15 minutes, or until cooked in the middle and edges are crispy. 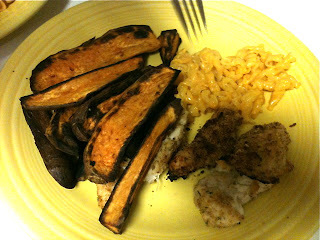 Yes, the sweet potatoes took over the plate. Yummm. 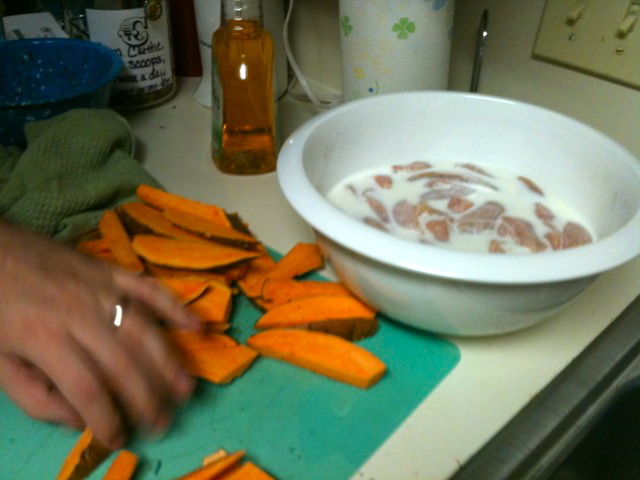 As a bonus, Matt made sweet potato fries for me. Delicious! Unfortunately, they were a little browner than I meant…I left them in the oven too long, against Matt’s suggestion. Oops. But they were delicious, I do admit. Hope fully attempt #2 will be better (and will merit more pics on here!). Eat, drink, do be merry!